Yet another academic year has come and gone and with it a new class of Fashion students graduate. 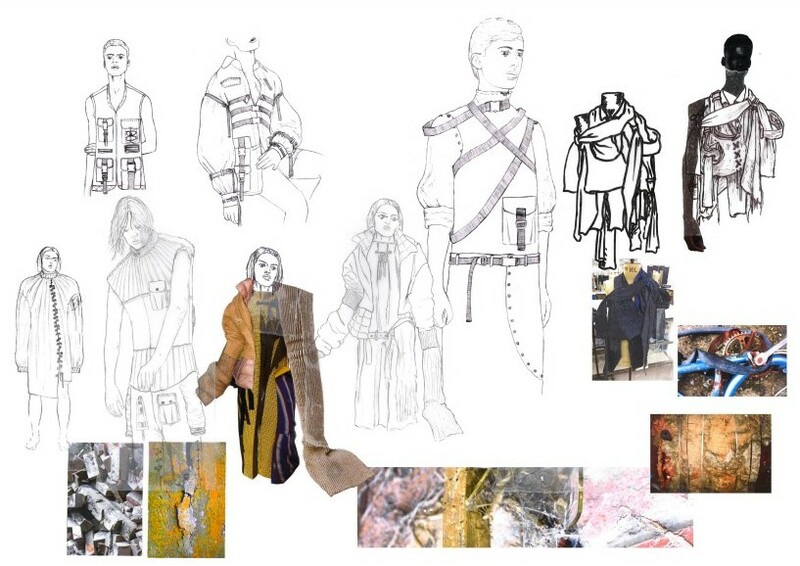 This year’s standard of BA collections was as high as ever, making it exceptionally hard to focus on key individuals. But we couldn’t help but be overly impressed, enthused and curious by a handful of students certainly set to take the industry in their stride… over to you Harry Odell. 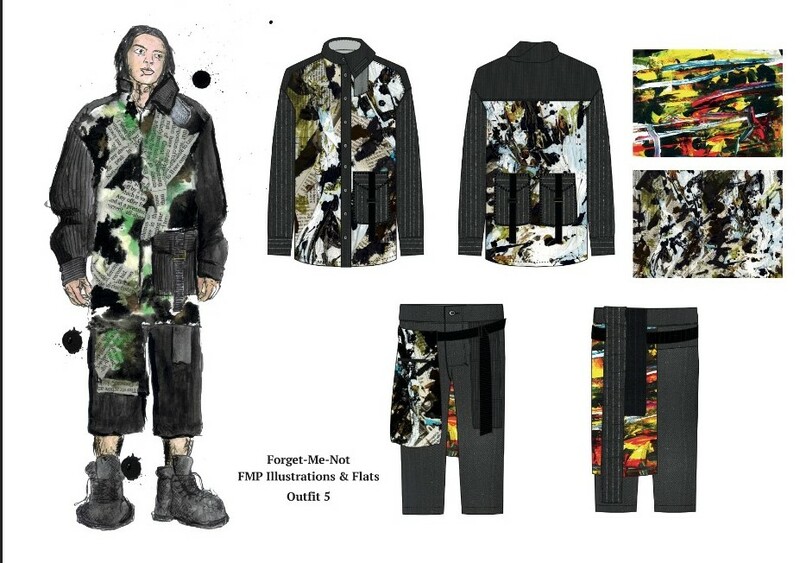 Harry Odell’s final line-up is a textile dream; combining print and weave in a wearable way. The beauty of the pieces commendably masks the heart wrenching pain of the hideous disease: dementia, which it is inspired by, making them even more fascinating. What were you inspirations and the basic path that your research took to form your final concept? I based my collection on dementia after my grandmother was diagnosed with the condition last year. This obvious loss of memory and loosed grip on reality she suffered pushed me to respond and investigate into dementia and its effect on the mind. I wanted to express my feeling of powerlessness towards it and the deterioration and decay within her, juxtaposing this with an empowering and dominant silhouette and print basis. This was so as to try and alight hope in the sufferers and those affected by this horrific disease, and bring it more to the forefront of people’s conscious. Thus, I started looking into a wartime Britain and how bombed and fragmented the landscape was, and saw comparisons within the cognitive thought processes in my grandmother. I experimented with collage and saw a general oversized aesthetic reflected the topic, feeling that the effected brain was almost shrinking into an excess shell of a body. Continuing this theme, the draping straps of fabric that developed out of my research and collages echoed the hanging ideas of abandoned thought that I devastatingly saw happening over time with a mind under threat from this disease. 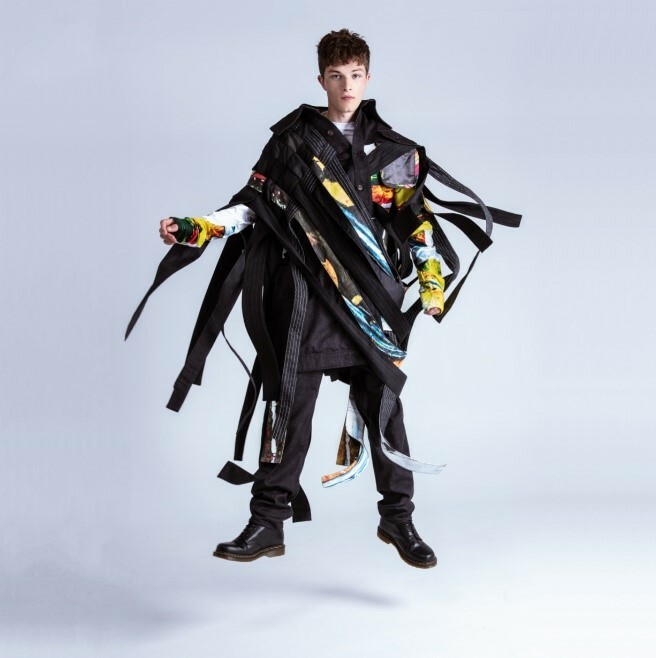 Your looks are an amazing mix of tailoring, contemporary streetwear and textiles, which takes great skill to combine as aesthetically pleasingly and wearable as you have. 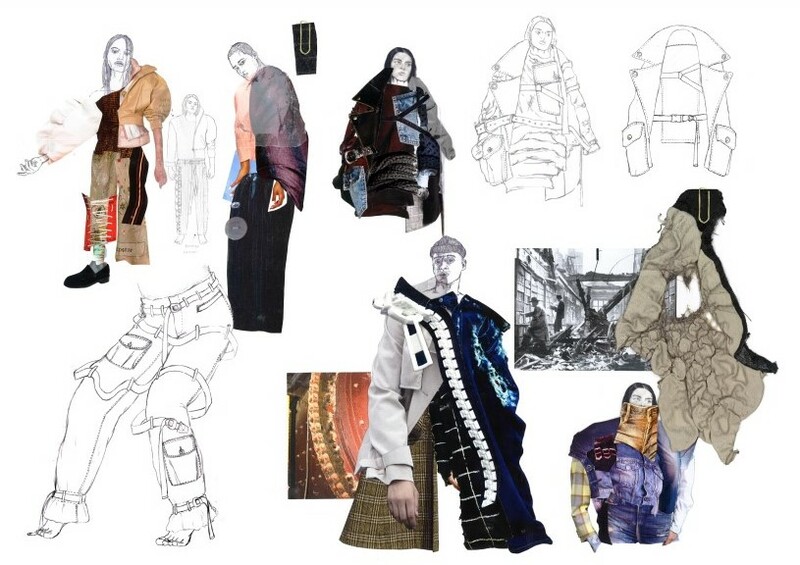 Can you talk us through the most challenging piece you had to create and the thought process behind the design? 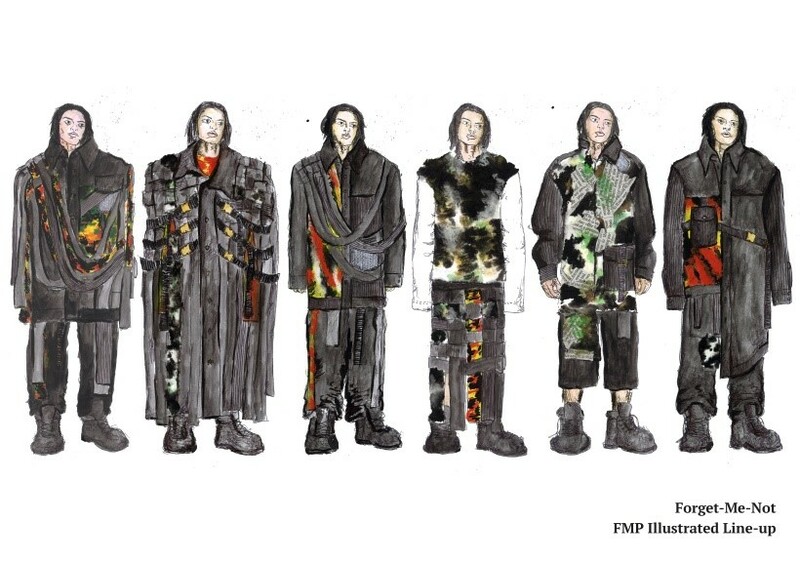 The most challenging piece I created was probably my look 1 outfit with the deconstructed weave jacket and hanging pocket trouser bags. 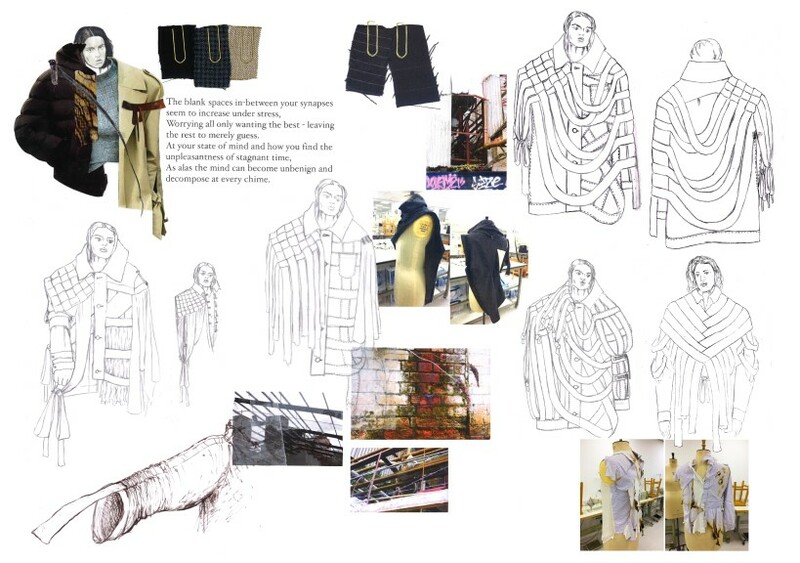 This outfit was inspired by the functionality and hardwearing nature of a solider’s uniform, with the deconstructed panels and weaved straps echoing the absent and tangled paths of lost synapses. To continue the oversized bold silhouette into my designs, I made sure the jacket was large on the figure to make the wearer look powerful, but making sure as not to engulf and swamp them. I wanted to use classic British heritage fabrics such as pinstripes, herringbones and denims to parallel this older aesthetic, and similarly monotonous rationed colour range of a wartime Britain. 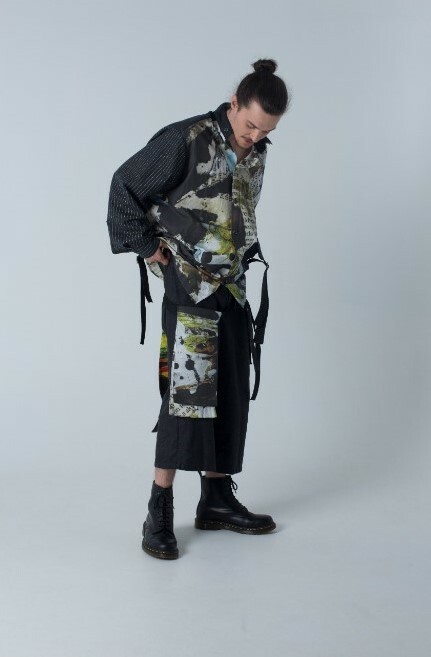 But, I wanted to create a harmonic discordance between the older traditional tones and the contemporary colours, so I incorporated a vibrant print into the straps on the jacket and trousers as well as the lining of the jacket and the curved seam line in the t-shirt. What direction has the last year of your degree inspired you to take with your future career? 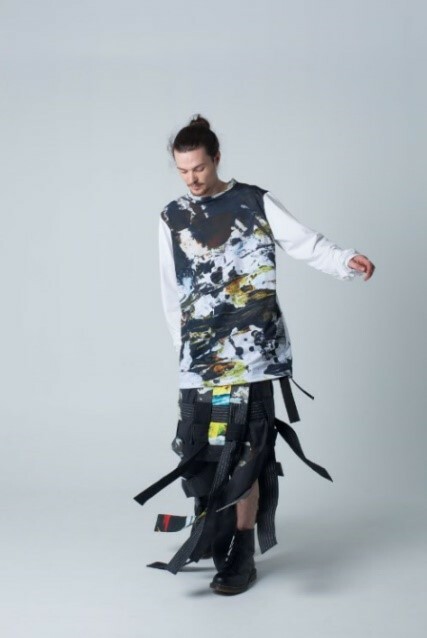 Through producing this collection it pushed me to refine my design and production technique to a higher and more sophisticated degree. With this grater understanding of different types of production I can incorporate this into how I produce things in the future. I still feel very assimilated to streetwear and street culture, but shall incorporate this new reverence and respect for traditional silhouette and styles, aiming to fuse together a more casual formal-streetwear style for the future. Why did you choose the fabrics and colour pallet you have? Sustainability has always been integral to my thought and design process, so when I set about initially thinking of ideas for my collection I always had the environmental value and cost closely in consideration. Thus, with sustainability in mind, the fabrics I used were organic brushed black denims, cotton and wool mixed pinstripes (of four different types), eco-cotton canvas printed fabric and eco-cotton poplin printed fabrics, as well as a grey herringbone used for pocket bags. Did you create the print yourself, if so what was it based on, and what techniques were used to create it? I made the two reoccurring prints myself. The main bold red and yellow-based one was created with red and yellow acrylic paints, splattered over a collaged magazine base, on a cardboard backing that I re-used from a box my fabrics arrived in. I entwined these acrylics with black Indian inks to create a depth of colour. Then, to bring this out I brushed white acrylics over the surface, attempting to convey the discordance in a dementia-ridden mind. The second print was made of the same cardboard backing, but with a mix of newspaper and old white plastic bags glued down over the surface to create depth with texture and dimensions of shape and form. I then went over this basis with a mixture of black and an off brown inks, splashing colour over the surface, which then dried with interesting patterns and colours. Check out more of our GFW 2018 articles here.